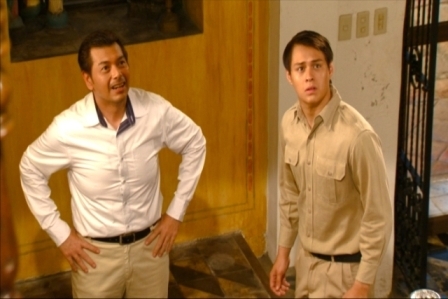 Enrique Gil Portrays Senate President Juan Ponce Enrile in His Very First 'MMK' Episode! After the success of the hit royal teleserye “Princess and I,” Enrique Gil makes a grand return on television this Saturday (April 27) as he stars in his first ever “Maalaala Mo Kaya” episode. Enrique will surely touch the hearts of “MMK” viewers as he showcases his remarkable talent in acting in the two-part special heavy drama episode of ABS-CBN’s longest running drama anthology. The Kapamilya Primetime Prince will give life to the role of Senate President Juan Ponce Enrile, who was born with the name Juanito Furagganan. Juanito grew up exposed to poverty because of the abandonment of his father. When he joined the guerillas during the World War II, Juanito’s life changed as he was imprisoned and was brutally tortured by their enemies. How will Juanito’s experiences help in molding and strengthening his personality? Joining Enrique in this “MMK” episode are Malou de Guzman, Bugoy Cariño, Bernard Palanca, Paco Evangelista, Ya Chang, Helga Krapf, BJ Forbes, Josef Elizalde, Marx Topacio, Efren Reyes Jr., Alicia Alonzo, Bodjie Pascua, Rochelle Barrameda, Ian Galliguez, Simon Ibarra, Joe Gruta, Jong Cuenco, Almira Muhlach, and Jessica Connelly. It was researched by Akeem del Rosario, written by Mark Duane Angos and Arah Jell Badayos, and directed by Nuel Crisostomo Naval.